Sandy Cove along the Viking Trail, Newfoundland. Another pretty heavy day of 'office' work, but later we volunteered our services to collect supper for that night. We left Main Brook and headed for Sandy Cove where the bounty was said to be! You've probably guessed by now what's on the menu for tonight ... Lobster - straight from the ocean! We arrived in Sandy Cove just as the fog began to close in along the coast. As per our instructions, we headed straight for the fishing wharf where we met the fisherman and were introduced to some real Newfoundland dialect. It was quite comical - we laughed at ourselves of course, because here we were watching these fishermen sorting through their catch of the day, talking with each other in english (I think) but we didn't understand a single word. This was fine until we were periodically brought into the conversation by one of these friendly chaps and had absolutely no clue how to reply - instead we stood there passing uncertain glances between each other in the hope that the other had understood. Eventually, one chap took us over to select the lobsters of our choice, nattering as we went and after a while thought to ask us a question about what we wanted ... after several attempts at interpretation and looking like stunned mullets, we figured out that he was asking if we wanted "he's or she's". With our 'live' supper safely loaded in the back, we headed off back towards Tuckamore Lodge. Enroute back to the lodge, we couldn't help but make several stops along the way for photographs. The fog made quite an interesting backdrop to the coastal communities, and pack ice which still remained in the harbours. 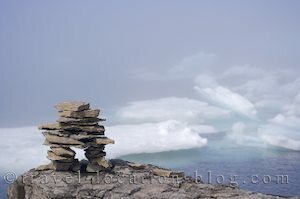 We definitely had to stop when we saw an inukshuk backdropped by both the pack ice and fog.